How far should you aim to conduct your lessons in French? With young beginners, the teacher will probably want to keep much of the talking about language, culture and setting up activities in your own language - but using French where it is clear the children understand what is said and how to respond. The video gives you some starting points: you see the contexts in which simple, authentic language is used by a French teacher with her class in a primary school in France. We recommend these books to give you some more ideas to help you enhance your lessons with the Continuation Pack. The second one is for secondary teachers, but has examples in French. 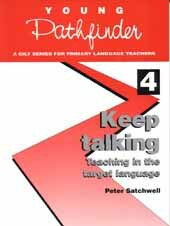 Provides detailed guidance on how to ensure progression by developing the use of the target language. It gives a range of practical advice with examples on how to communicate in the classroom, discusses the importance of progression, and shows how to organise displays. It also contains an appendix of useful target language for use in the classroom in both French and German . Contents: Introduction - Communication in the classroom - Progression - Displaying the target language - Conclusion - Appendix 1: Target language for classroom interaction - Appendix 2: Common first names - Appendix 3: Bibliography - Appendix 4: Useful addresses.